Late word that the powering down of the Ham Radio system has been delayed until some time around 1900 UTC today. A few of you will now have one more chance at some ISS activity from Richard. 10:30 p.m. Eastern [ 0230 GMT]- Expedition 17/Spaceflight Participant Deorbit Burn and Landing Coverage (deorbit burn scheduled at 10:44 p.m.[0244 GMT], landing scheduled at 11:36 p.m.0336 GMT]) - JSC/Kazakhstan (Public and Media Channels). Richard is scheduled to depart the ISS about 0012 GMT on Friday, Oct 24 when his Soyuz capsule will undock and prepare to return to Earth. 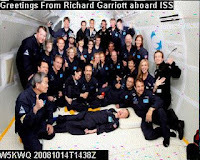 This image received by G0TTV seems to be Richard saying farewell from the ISS. 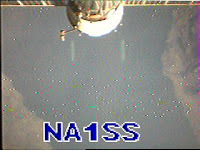 The ARISS SSTV web pages are back up at the http://ariss-sstv.ssl.berkeley.edu/SSTV/ site. We've been able to do some testing, but please let me know if you experience any difficulties. Once again, my apologies for the outage! It appears to be a tribute to the interest in Richard Garriott's ham radio activity on board the ISS. I think you all can agree that this has been a stellar and an historic week for Amateur Radio on the International Space Station! Speaking on behalf of the ARISS international team of volunteers and the AMSAT community, we really appreciate the overwhelming flood of positive comments that we have received from the ham radio community and the general public regarding the ham radio operations on ISS this past week. Collectively, we have all made history….starting with Richard, W5KWQ and his father Owen, W5LFL and continuing with all of you that participated and/or volunteered in his ISS journey. And along the way, we have sparked the imaginations of thousands of students. Got more interest in satellite operations. And, I understand, excited some youths to the point where they are now licensed. Richard Garriott, W5KWQ has been extremely prolific on the ARISS ham radio system, making hundreds of voice contacts, operating the packet system during the crew sleep times and transmitting hundreds of SSTV images throughout the day. He put the newest ARISS hardware, the Kenwood VC-H1 to good use, performing the vast majority of contacts with this hardware system coupled with the Kenwood D700 Transceiver. 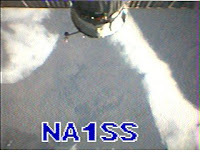 The remaining SSTV downlinks were performed with the software-based SSTV system---using either the SpaceCam software or MMSSTV software that are on-board ISS. Given the limited availability of ISS computer systems, the ARISS team will continue to utilize the VC-H1 well after Richard's flight. So don't be surprised if you see some VC-H1 SSTV operations from Mike Fincke, KE5AIT, during his stay as the commander of Expedition 18. The team apologizes for the temporary shut-down of the ARISS SSTV server. We have been a victim of our own success in that the site has been overwhelmed by the popularity of Richard's SSTV images. We hope to get the system operational very soon. This may take a URL change, so please check the listservs and the ARISS SSTV blog http://www.ariss-sstv.blogspot.com/ for updated information. http://www.ariss.org will also carry updates. As a reminder to all, the ARISS team is an international volunteer working group that is sponsored by three major entities in each ISS region---the National Amateur Radio Society, the International AMSAT organization and the National Space Agency. The 5 regions that comprise the ISS development are Canada, Europe Japan, Russia, and the USA. In the USA, the two ham radio sponsors are the ARRL and AMSAT-NA. NASA is the USA space agency sponsor. Over 12 years ago, the formulation of the ARISS working group was a specific request from NASA. They wanted the amateur radio community to internationally consolidate into one team all the development and operations of the ISS Ham radio system. This specific request from NASA, and ultimately the other space agencies, was to provide a single focus of ham radio on ISS within the amateur radio community and within the space agencies. As a result, the 5 international delegations that make up ARISS tightly coordinate the day-to-day mission operations as well as the strategic hardware development planning and implementation. The success of this past week would not have been realized without this tight coordination, particularly between our Russian colleagues, led by Sergey Samburov, RV3DR and our international operations team, led by Will Marchant, KC6ROL. Individuals are always welcome to volunteer their support to ARISS through their regional delegation. Please see the ARISS web site http://www.ariss.org for more information on your regional delegates. We have received some reports of individuals providing advice to the ISS on-orbit crew or making specifc requests to the ISS crew to change or modify the ARISS hardware, on-board software or ham radio operations. The ARISS team would like to remind the amateur community that we all have a duty to the international space agencies to coordinate ISS ham radio operations through ARISS. Our advice to you is that if you have a specific request or idea, that you forward it to one of the ARISS international delegates or ARISS team leaders. 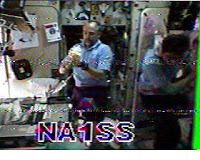 These individuals are identified on the ARISS web site http://www.ariss.org. Also, please remember that there are a *lot* of hams that would like to get their QSO with the ISS (including me!) So please use courtesy and keep your contact short. And once you have made a contact, please do not go for a repeat…despite the intense temptation to do so. I think you all know that this is an "open" hobby. So all are listening in, observing and remembering your operating habits. On behalf of the ARISS team, I thank you all for your interest in Ham Radio on ISS. Enjoy the contacts! And remember the ARISS teams and organizations that have made the ham radio system on ISS such a tremendous success. This includes the national amateur radio societies and international AMSAT organizations. As well as the international space agencies and the ISS on-board crew members. Richard has now completed all of his scheduled amateur radio events and most of his other planned experiments. He should have much more free time Tuesday (GMT) afternoon and Wednesday morning so it is possible that he could choose to do more voice contacts during those periods. The crew is scheduled for 4 hours of nap time from 1300-1700 GMT on Wednesday to begin the sleep shift necessary for them to begin preparations of their Soyuz vehicle. A request to have the SSTV system active during the Tuesday night sleep period and during the nap has been submitted. Hopefully, that will permit persons in other parts of the world the opportunity to capture some SSTV images (though many will be at night). The ISS crew will be awake until midnight GMT on Wednesday and then awake at noon GMT on Thursday to begin a long day of preparations for their return trip home. One of those preparations will be to shutdown the ham radio system about 1430 GMT. The hatch between the Soyuz and ISS is planned to be closed at 2105 GMT Thursday, undocking at 0012 GMT on Friday and landing in Kazakhstan at 0336 GMT on Friday. Richard completed the sixth of the seven school contacts planned during his tour on the ISS. This is already the most every completed by a space flight participant. 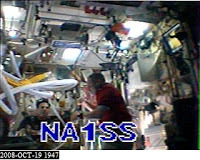 He continues to downlink SSTV imagery and make general contacts as his time permits. 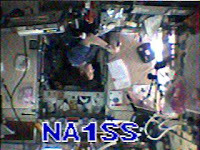 One of the downlinked images received by 7Z1AQ shows Richard inside the Service Module of the ISS. A really clear image taken over the Middle East was received by HZ1AM. Richard is scheduled to return to Earth on Oct 24 with the Soyuz undocking scheduled for 0012 GMT. Richard continues to have success with his school contacts and has been making general contacts including some reports that he made a few JOTA contacts this weekend. Richard also began sending images from within the interior of the Service Module on the International Space Station. Some of the clearer images are posted below. Additionally, Richard has sent some other interesting photos and images he prepared prior to launch. Check the ARISS SSTV Gallery for continuous updates. Bauer explained that Richard Garriott's flight on the ISS is "a part of history. Some of you have asked why Richard is using his call sign for some QSOs and SSTV contacts, instead of the ISS station call signs. There is a long and proud history that is attached to the Garriotts. This includes ham radio in space and their personal call signs. 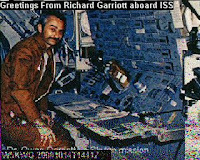 Twenty-five years ago, Richard's father, Owen Garriott, W5LFL, initiated the first ham radio contacts from space on the STS-9 SAREX mission. Richard, W5KWQ, is following in his father's footsteps, using the ARISS ham radio system extensively on his first flight. Richard's call sign is actually his grandfather's original call sign. So you can see that this mission touches three generations of ham radio and two generations of ham radio in space!" Below are some of the most interesting images received Oct 16. Note the Soyuz spacecraft at the top of the images. It was quite an exciting day for ARISS yesterday with the Expedition 18 crew docking and the start up of Richard Garriott's ham radio activities. Here are some updates and plans for ARISS during Richard's flight. Richard, W5KWQ, fired up the radio and started SSTV operations just a couple of hours after docking. 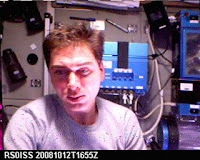 Prior to flight, Richard planned to support a slide show mode using the SpaceCam software and the SSTV interface box at the beginning of his flight. This is what you saw yesterday. Richard downlinked a number of SSTV images using Martin 1, a higher quality but longer transmit SSTV mode. The Russian team, led by Sergey Samburov, RV3DR, had requested testing several high quality image modes during Richard's flight, so don't be surprised if you see Martin 1 or other high resolution SSTV modes during Richard's flight. We asked Richard to move to the default Robot 36 mode for the time being and to space out the images once every 3 minutes to reduce the radio transmit duty cycle. Richard confirmed that he will support this. He also has transitioned to the VC-H1 as this will allow Richard to use the computer to support his Earth ops and still support SSTV. SSTV uplink/downlink: Richard is really not supporting SSTV uplinks during his short duration mission. The downlink is on the normal ARISS VHF downlink, 145.80. General Voice Contacts: Use the regular general voice frequencies. 145.80 downlink. Uplinks are 144.49 in Region 2 (Americas) and 145.20 for Region 1 (Europe, Africa, Middle East) and Region 3 (Australia, Asia). Richard and Mike Fincke, KE5AIT, have been on the air on voice since shortly after docking yesterday. Sleep Period Activity: We have asked the crew to turn packet on during sleep periods. Our intent is to keep SSTV active during their work day. 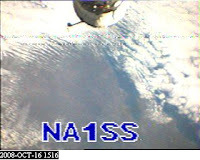 The rationale for this is that we are having some issues with the software based (SpaceCam) SSTV system occasionally keeping the radio keyed down after an image transmission. And we have a limited set of Russian batteries available during Richard's flight for the VC-H1. Additional SSTV Information: The computer-based SSTV can also support SSTV picture taking using a USB camera. We don't anticipate Richard using this as his primary SSTV operations for his mission will be with the VC-H1. 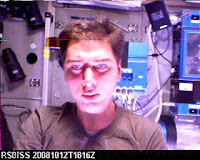 The USB camera was checked out over the weekend by the Expedition 17 crew, where they took photos of themselves and downlinked these to the ham community. You are witnessing and are a part of history: Some of you have asked why Richard is using his callsign for some QSOs and SSTV contacts instead of the ISS station callsigns. There is a long and proud history that is attached to the Garriotts. This includes ham radio in space and their personal callsigns. 25 years ago, Richard's father, Owen Garriott, W5LFL, initiated the first ham radio contacts from space on the STS-9 SAREX mission. Richard, W5KWQ, is following in his father's footsteps, using the ARISS ham radio system extensively on his first flight. And Richard's callsign is actually his grandfather's original callsign. So you can see that this mission touches 3 generations of ham radio and 2 generations of ham radio in space! JOTA: Remember that Jamboree on the Air is this Weekend! Scout groups are welcome to call Richard or Mike Fincke over the weekend using the General Voice Contact frequencies (see above). Enjoy the ARISS operations!! And my thanks to the international ARISS team for their outstanding volunteer support. Today (Oct 15), Richard is scheduled to speak with his father in Moscow and the Mayor in Austin, Texas. He has installed the VC-H1 in the window and some very nice Earth views are being sent down on 145.800 in Robot-36. He has been heard making general contacts (when time permits) on the same downlink but using the standard 145.20 uplink over ITU region 1 (Europe, Africa and Russia) or 144.49 uplink over ITU regions 2&3 (everwhere else) . During the crew sleep cycle, the radio should be switched to packet operations on 145.825. This image was image taken over western North America and received by KD7TOG. Below is an another image taken over western North America and received by KD8CAO. Some initial imagery has been received during the 1430 UTC pass over Europe. Be ready as imagery should continue to be transmitted during the crew awake periods (roughly 0600-2030 UTC). In addition, Voice contacts are possible during the same time period. Below is an example of the many images received (these by radio operator 9H1FF). Commander Edward Michael "Mike" Fincke and Flight Engineer Yury Valentinovich Lonchakov of the 18th International Space Station crew docked their Soyuz TMA-13 to the Earth-facing port of the Zarya module at 00:26 a.m. UTC Tuesday. Hatches between the two spacecraft were opened at 01:55 UTC. A welcome ceremony and a safety briefing for the new arrivals followed. The new crew launched from the Baikonur Cosmodrome in Kazakhstan at 23:01 UTC Saturday to begin a six-month stay in space. With Fincke, an Air Force colonel, and Lonchakov, a colonel in the Russian Air Force, is spaceflight participant Richard Garriott, flying under contract with the Russian Federal Space Agency. Garriott will return to Earth with Expedition 17 crew members, Commander Sergei Volkov and Flight Engineer Oleg Kononenko, in their Soyuz TMA-12 on Oct. 23. Expedition 17 launched to the station April 8. 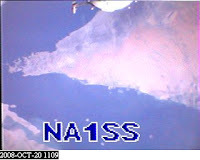 Several operators are reporting that ISS is transmitting test images today (Oct 12) beginning about 1700 UTC. Two formats have been reported. Robot-36 (which is anticipated for most of Garriott's flight) and Martin-1. 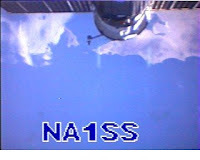 Several operators have uploaded these test images to the ARISS SSTV gallery. These test images will likely be removed to make way for the Garriott images when they begin coming down. 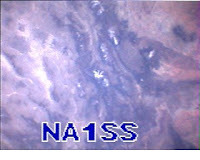 The following are examples of images received from the ISS (of Exp. 17 Commander, Sergei Volkov) by CT1EAT and N1JEZ. Commander Edward Michael "Mike" Fincke and Flight Engineer Yury Valentinovich Lonchakov of the 18th International Space Station crew launched in their Soyuz TMA-13 from the Baikonur Cosmodrome in Kazakhstan at 3:01 a.m. EDT Sunday to begin a six-month stay in space. Less than 10 minutes after launch their spacecraft reached orbit, and its antennas and solar arrays were deployed shortly afterward. The ARISS team has a lot of exciting activities planned for the next few weeks, including the flight of Soyuz 17S to space station with Richard Garriott, W5KWQ and Mike Fincke, KE5AIT on-board. The following represents some new information and capabilities that we are rolling out to the community to prepare for Richard's and Mike's flight. Please go to www.ariss.org/, www.amsat.org/, www.arrl.org/ and www.issfanclub.com/ for real-time information updates. The ARISS SSTV team announces the new ARISS SSTV Web Gallery and Blog. 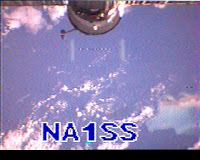 A website has been established to enable amateur radio operators to share their pictures received from the International Space Station's SSTV system. People wishing to view photos captured from the ISS or upload their own captured pictures can go to www.amsat.com/ARISS_SSTV/ . There is also a blog in which the ARISS SSTV Team will post announcements and additional information about the project. The blog can be viewed at http://www.ariss-sstv.blogspot.com/. To prepare for the upcoming SSTV operations, you are welcome to "try out" the new Web Gallery by posting past SSTV images (on-orbit and terrestrial). These will be deleted prior to the ARISS SSTV events that are planned for this weekend and during ISS Expedition 17 and Richard Garriott's flight (see below). The ARISS team received word from ARISS Russia delegate Sergey Samburov, RV3DR, that the current ISS crew expect to transmit SSTV on October 12 from 18:00-21:00 UTC. This is your opportunity to test out your SSTV reception capability and to post images on the ARISS SSTV Gallery. The planned downlink for this operation will be 145.80 MHz with Robot 36 as the expected SSTV mode of operation. 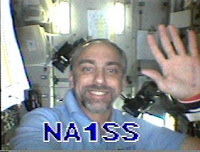 Thanks to Drew, KO4MA, AMSAT-NA VP for Operations, this weekend AO-51 will operate in a special mode in anticipation of Richard Garriott's visit to the ISS. Richard's launch is currently scheduled for October 12th, with docking at the ISS on the 14th. Richard plans on being very active from the ISS ham station, including extensive operation with Slow Scan Television (SSTV). In preparation for this event, AO-51 will be configured with dual repeaters for the weekend of October 11th and 12th. The primary repeater on AO-51 will be configured with an uplink on 1268.700 FM and downlink of 435.300 FM, and will be designated for this period as an SSTV repeater. 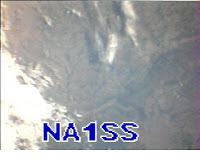 Users are encouraged to exchange SSTV images in ROBOT 36 mode, as an opportunity for others to practice receiving SSTV images from space before the ISS activity. Please keep the images transmitted to space-related themes, and to the ROBOT 36 mode. Polite and courteous operation among those sharing the uplink is crucial to the success of this mode. Concurrently, there will be a QRP voice repeater running on 145.880 FM uplink and 435.150 FM downlink. Users are asked to use 10 watts or less, and omnidirectional or handheld antennas only. Good luck receiving SSTV images this weekend, and from the ISS during Richard Garriott's flight. As stated previously, Richard plans to perform several school contacts and downlink SSTV images during his flight. He also plans to contact the general ham community in his free time and perform random scout contacts during Jamboree on the Air. SSTV downlinks are planned on 145.80. SSTV uplinks are not currently planned. The standard general contact frequencies will be used to support the Jamboree on the Air and general QSO passes.